A fully loaded gaming desktop. 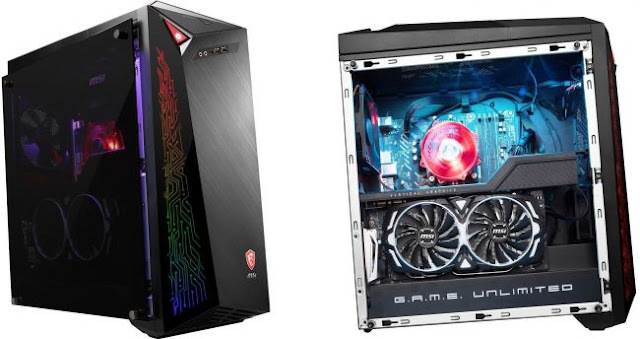 Over at Newegg, you can pick up MSI's Infinite X desktop with an Intel Core i7-8700 processor and GeForce GTX 1070 Ti graphics card for $1,549.99, marked down from its $1,699.99 list price. The same desktop sells for $1,699 on the nose at Amazon, through ExcaliberPC, so you're saving a nice chunk of change on this desktop. It's a well-configured machine, too. In addition to the CPU and GPU mentioned above, it comes loaded with 16GB of DDR4-2400 RAM, a 256GB M.2 NVMe solid date drive, and a 2TB mechanical hard drive (7,200 RPM). All of this is plopped into an MSI-brand Z370 motherboard, though MSI doesn't say which exact model. The graphics card predictably looks to be an MSI-brand variant as well—the Armor SKU, if the photos are accurate. It's a nice gaming box, though not necessarily cheaper than building your own. We priced together a similar configuration for a little bit less, assuming a higher-end case and factoring in the cost of Windows 10. That's the way it goes now that graphics cards are selling for closer to MSRP these days. However, if you don't have the time to build or are looking for a gaming PC to recommend for a friend, the Infinity X is a solid option with off-the-shelf parts that's about $150 below its MSRP today. Go here to grab this system.